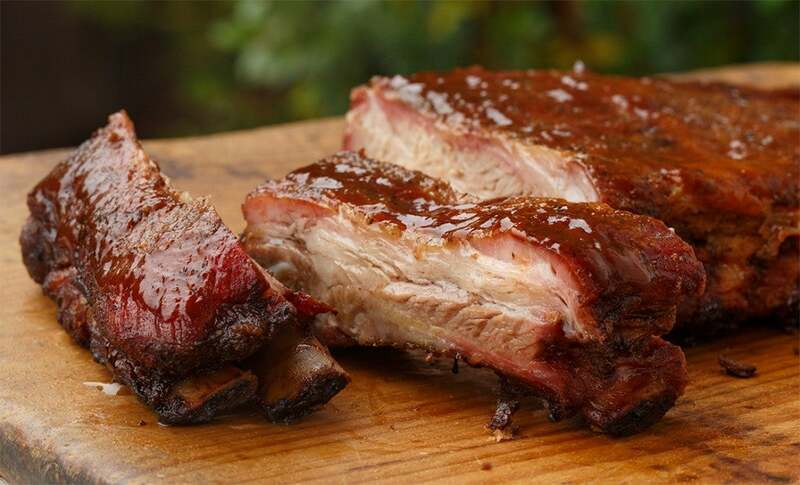 Learn the easy way to smoke tender, juicy BBQ ribs. Unlike a steak or hamburger, you can’t just throw a rack of ribs over some hot coals and grill it (unless you enjoy tough, dry ribs). Authentic BBQ ribs are slow-smoked over charcoal and wood. Once you learn this proven technique for succulent smoked ribs, you’ll be surprised how easy it is to make perfect ribs, every time. Skin and rub the ribs. After rinsing the ribs in water and patting dry with a paper towel, remove the skin-like membrane located on the bottom or “bone side” of the ribs. Slide a dinner knife underneath the membrane between the bones at about the second or third bone from the end, then grab the membrane with a cloth and peel it off of the ribs. Using a heaping tablespoon of rub per side, sprinkle it evenly on both sides. Do not apply sugar-based sauces at this time. If you’re using a kettle-type grill, use an indirect technique like the snake method to set up your grill. 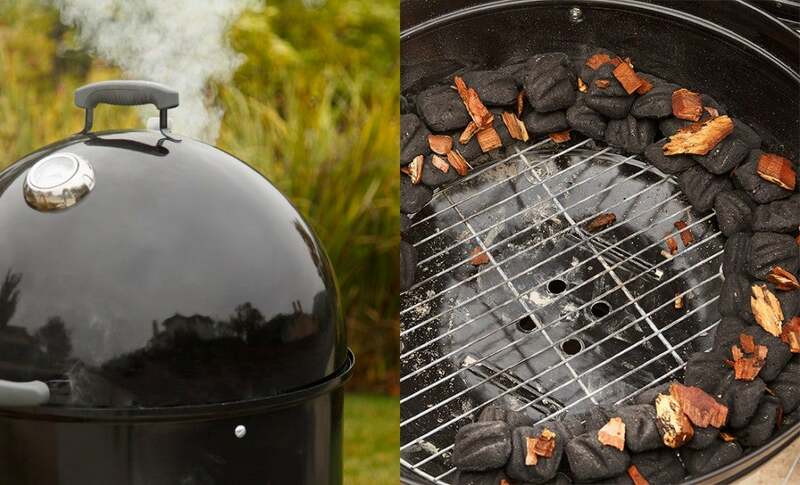 For backyard smokers, set it up for a long smoke. With either method, soak a few handfuls of Kingsford® Wood Chips (hickory or mesquite) for about 30 minutes before placing atop the coals. Place a drip pan filled with water or apple juice directly under the meat. This water will help moderate the grill temperature and add moisture to the air when the liquid evaporates. 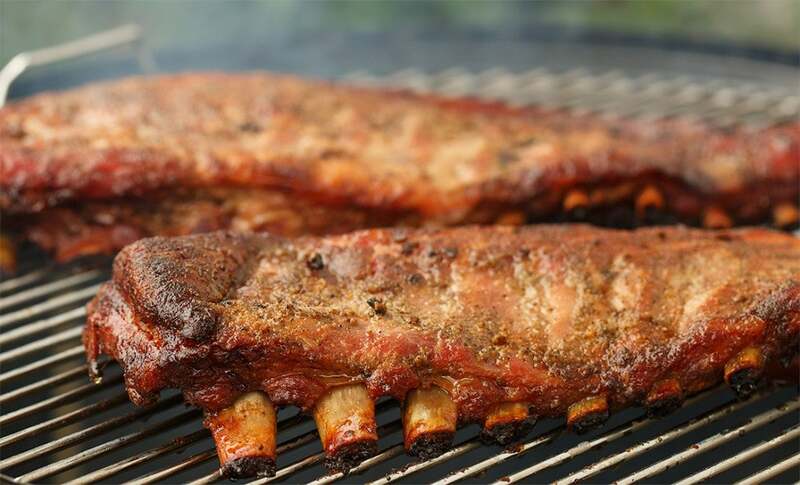 Smoke the ribs at 107°C to 121°C for four to five hours. You can baste or mop the ribs occasionally if you like, but don’t open the grill too often. Maintaining a steady temperature is the most important thing. Opening the grill causes wide temperature changes. If smoke starts to die down, add more wood chips. To cook several racks of ribs at once on your smoker or grill, roll each rack into a ring with the bones standing vertically, and secure them with a bamboo skewer. Some people wrap their ribs after two hours or so of smoking. The so-called “Texas Crutch” can help speed cooking and keep ribs moist. However, the ribs can overcook, so the meat falls too easily off of the bone.